The Internal Revenue Service (IRS) just announced a new US Tax Form, simplified and much smaller in size, intended to replace not only the current form 1040 but also forms 1040A and 1040EZ. These changes relate to the new and simplified tax rates already in effect in the United States since January 1, 2018. The two-page draft form is smaller than the current two-page form, but that's because many line items have been consolidated and/or shifted to other forms and schedules. Tax payers will note that the new schedules use numbers for identification purposes instead of letters (A, B, etc). That's because the schedules which use letters, like Schedule C, are still in play. Washington DC, Aug.6 DP.net).– Today the IRS announced they are working on changes to the 1040 tax forms. The IRS said that “this new approach will simplify the 1040 so that all 150 million taxpayers can use the same form. 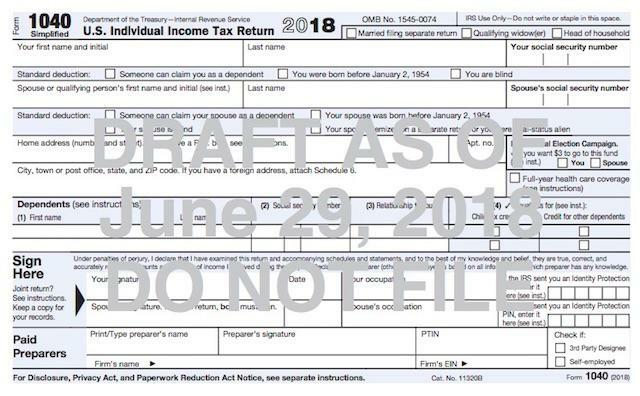 The new form consolidates the three versions of the 1040 into one simple form.” In addition to shortening Form 1040 to a postcard-sized return, the changes eliminate Forms 1040EZ and 1040A and increase the number of tax schedules supporting Form 1040 by six additional forms. The 1040 forms (1040, 1040A, 1040EZ) are the most common tax forms. The announcement today is the first major change to 1040 tax forms in decades. Tax time is one time of the year many US residents and citizens get a full snapshot of their financial picture. Taxpayers’ active participation in tax preparation is the backbone of the American tax system, giving them a better understanding of their true financial picture. If the taxpayers have a straightforward tax situation and claim the standard deduction they will probably be able to file their taxes using the new Form 1040 only. The standard deducation has doubled for this tax year and future ones. If they have itemized deductions, their tax deductions will still be included on Schedule A. Itemized deductions include deductions for homeowners like home mortgage interest, property taxes, and interest paid on a home equity line of credit used to improve their home. Many other deductions will remain the same. new Schedule 1, for example, has items that used to be on the main form, such as state-tax refunds, capital gains and unemployment compensation. Not counting new schedules, signature spaces and tick boxes, the new 1040 has just 23 lines (the previous form had 79). but a new Schedule 1, for example, has items that used to be on the main form, such as state-tax refunds, capital gains and unemployment compensation.